I hope you are having a great weekend :) It's been a mix of the usual for me - Roger/Pizza Express/IKEA/Sleeping/Cleaning/Working. I can't complain though as I am off on holiday to Singapore on Thursday and so excited. I am even being organised with my packing and setting things aside now - rather than the last minute stuff-and-go that I seem to perform hours before a flight. I do have a sunglasses problem. This is true. The picture below is not even the whole story - I have a few pairs waiting for me in the UK - but I feel justified buying them here as they really are something you wear every single day. So the latest pair was inspired by Lisa from The Real Housewives of Beverly Hills. No lie - it really was. I saw her wearing a pair of brightly tinted aviators in a recent episode and loved the impact that they made. Ray-Ban came out with the pair below as well as a pretty warm/golden shade. Both are amazing but I plumped for the blue/green as I thought it was more unusual. I wear a lot of neutral clothes so thought that this was one way to add much needed interest. The next one is a bit more conventional and from Primark. It's a white tweet laced with silver thread - and I wore it today. I think Primark did well with this one. Other than a slightly scratchiness at the neck if feels like a high quality jacket - Zara-esque - and I think it cost about £16. It's so easy to wear and brings even the slobbiest of outfits together. Hurrah! This is a bit of a cheat as I don't actually have my hands on this bracelet yet - but I got the shipping notification and it's only days away from being on my wrist. 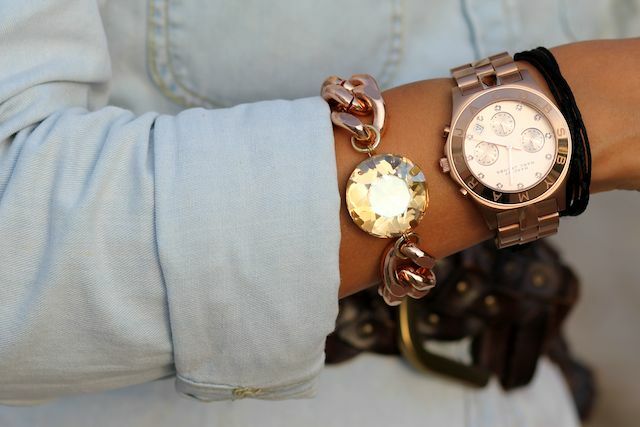 I saw this on my friend, Teresa, and loved the stone/rose gold chain hardware combination. It's chunky and firmly on the statement side of things but yet still unbelievably pretty. I cannot wait to wear it. I also managed to pick up something else from the etsy store...the seller has some fantastic pieces. I have held back on the makeup - I did buy some MAC items at duty free a few weeks back but honestly there is nothing to write home about. I really like the primark blazer, what a find! 1- i need your sunglasses collection. 2- i L O V E that galaxy blazer. it makes your haircolour look really virbant. you need to wear it outside, woman. if there's a place where you can pull that balzer off is dubai! 3- i need that blazer from primark. preferably in black. Ugh those Ray Bans are on my wishlist. Absolutely beautiful! There is always so much skincare/ makeup to haul in Asia. I find myself getting a lot of sheet masks and Japanese and Korean brand makeup. Have a nice trip! I love Primark Blazer! looks so classy! For sure you'll have to haul some Asian skincare and makeup there! And all the little quirky places! I love Oia Jules bracelets, so many pretty ones. Like the one you've chosen a lot! Singapore is an awesome city, you'll love it, shopping is fab there! You don't really need any extra help for spending your money! Don't think I've had chance to say happy new year to you yet... so Happy New Year, hope its a great one for you! From the small thumbnail I thought the sunglasses were a tray of chocolates. Haha, I clicked straight away! I love your sunglasses especially the House of Harlow ones you showed us a little while ago. I love sunnies and if I lived somewhere sunny I'd have loads of pairs too. I really like that Primark jacket! Ohmygosh you're coming to Singapore!!! I would say pack some rainy weather clothes with you because the weather has been very unpredictable the past few days. Like crazy sunny and then thunderstorms. Regarding shopping, well, that would definitely be along Orchard Road. Most of the shopping malls have pretty much the same stores, but one that has everything would be ION Orchard. :) And visit Watsons or Sasa for the Asian beauty products! There are also standalone stalls that sell Asian beauty items. I hope you have an amazing time! Can't wait to see how you feel about this little red dot! Wow welcome to Singapore then! I'm curious, what makes you decide on Singapore for holiday? 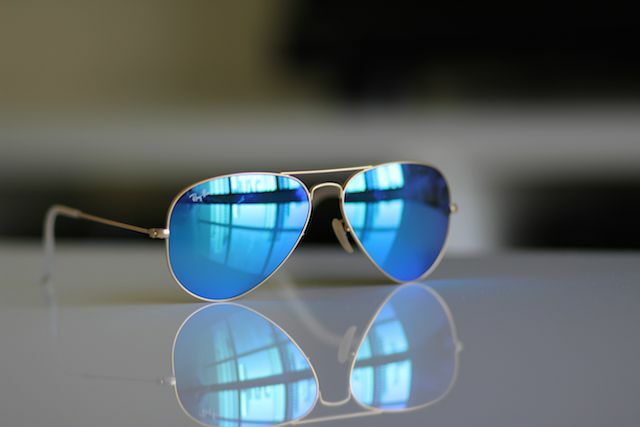 I so want those blue aviators now ! Will have to check my nearest sunglass hut ASAP. I absolutely love the Topshop blazer, I nearly bought the trousers in that material but didn't know what they'd go with in my wardrobe! OH MY GOD THAT TOPSHOP BLAZER. I NEED it. Loving the Primark jacket too! I have a similar one from Zara, but you can't go wrong with another one at £16. As regards clothes, I recommend layering because the weather here is very hot and humid, though once you get indoors the air-conditioning sometimes overcompensates - though I'm sure that's something you're well accustomed to in Dubai. Also, it's been raining on and off recently - and by this I mean heavy rain, none of that drizzly London stuff. For shopping I'd recommend ION Orchard and Takashimaya, although you'll find that a lot of the brands which are available in the US and UK mark up their prices quite a bit here. If you want no-brand clothes/shoes/accessories which is relatively cheap, try Far East Plaza or Bugis Street. You can get Asian skincare/makeup here at Sasa and Watsons - I'd recommend the humongous Watsons at Takashimaya. Good food is everywhere, but check out www.hungrygowhere.com for recommendations/reviews. Do try some local food. love the rose gold bracelet, the crazy TS blazer is soooo not you!!!! I love the cream jacket from Primark the most. Loved this post! Loving your sunglasses collection! Those glasses are amazing, you're tempting me! lol Have a fabulous time in Singapore! I can't believe you're coming to Singapore! I'm a Canadian but living in Singapore and would probably die if I saw my favourite blogger/ex-YTer! Orchard, Orchard, Orchard. I go there almost every weekend. I know you love shopping and so you probably won't be disappointed by Singapore, which I consider to be a shopping maven's paradise in addition to being one of the coolest cities in the world. Also - that galaxy blazer. Love. going back to the UK soon and hope to find that blazer in Primark! I love the blue sunglasses, they're really different! Loving that Primark blazer! Love it when a cheap piece makes an outfit look expensive & put together! Great items - lovely sunglass collection! Greetings from Munich! Where to find some stuff I think you'll be interested in. Celine: Official shop at Ngee Ann City. Unaffiliated franchise at DFS Galleria holds different stock and more likely you'll be able to get a Luggage/Trapeze/Phantom off the shelf here and duty-free. Zara & Topshop is everywhere in Orchard but Zara flagship is at Wheelock Place and Topshop's at Knightsbridge. H&M is at Ion basement and flagship beside Mandarin Gallery. Side-note for Ion basements. There are 4 levels of underground at Ion and B2 is where the train station is and where all the tunnels connecting other malls in the area converge. If you're lost in our sprawling underground, please do ask someone because it gets really crowded on weekends and you'll be utterly lost. I've once brought a hysterical British couple to ground level and outside the building because they've been searching for a way out for an hour and got claustrophobic! Side note also for Ion. You should start shopping here and then Ngee Ann City next. Between these 2 malls, you'll have covered most of the luxury and high street brands available in SG. Something special at Ion are the shopfronts for beauty brands like Chanel, YSL, Shu Uemura etc. that only sell beauty stuff. Ion specials: Penhaligon's, Bimba & Lola, 7 for all Mankind, Sephora flagship, Giuseppe Zanotti, only Valentino boutique in SG. Ngee Ann City specials include the only Club Monaco store in SG, Jo Malone, Takashimaya (Japanese Department Store), Kinokuniya (Japanese bookstore). Side note for Ngee Ann City: now being the Chinese New Year Period, there's a massive food fair at the basement where you can sample all the new year goodies like pineapple tarts and peanut cookies etc. Don't miss it! Wisma Atria specials: LUSH Cosmetics, Nine West, Tory Bruch, Coach, GAP. Chanel's only boutique in the Orchard area is at Ngee Ann City. Flagship however is at Marina Bay Sands. LV is at Ion and Ngee Ann City but flagship is also at Marina Bay Sands where they have a beautiful water pavilion to themselves on the bay. Gucci is at Paragon in the Orchard area together with Miu Miu flagship, Marni, Givenchy, Banana Republic and Jimmy Choo. Club 21 brands (Balenciaga, 3.1 Philip Lim, Alexander Wang) are a little out of the way at the Hilton Hotel Arcade. Christian Louboutin has the only store at Ngee Ann City. On Pedder, a store carrying brands like Reed Krakoff, Charlotte Olympia, Proenza Schouler and more, also carries Louboutin at Ngee Ann City and Scotts. Hermes can be found at Wheelock Place and the outlet at Scotts is also very well stocked. So, everything above is for the Orchard area. Close by is the Somerset area which caters to a younger crowd and feature brands like Forever21, Cotton On, HMV etc. Other shopping destinations further out include Marina Bay Sands for more luxury, the Bugis area and Haji Lane for unique, quirky, vintage shops and teenager hangouts. *Missed out Giorgio Armani Beauty from early. The only counter in SG is at DFS Galleria and it's all the better since it's duty-free. Sulwhasoo: High-end counter Korean skincare. Known for a pre-skincare essence that helps skin absorb everything better. Shisedo: Mid-range counter Japanese skin-care and makeup. Known for lipsticks, sunscreen, whitening range. Laneige: Mid-range counter Korean skincare and makeup. Known for sleeping mask, hydration range. Shu Uemura: High-end counter Japanese makeup and skincare. Known for false eyelashes, eyelash curler, mineral oil makeup remover, mousse makeup base. Ettusias: Mid-range counter Japanese make-up and skincare. Known for Mineral BB Cream, Lip Essence, Anti-Acne range. SKII: High-end counter Japanese skincare. Known for Treatment Essence (Miracle Water). Kose: Mid-range counter Japanese skincare. Known for their Black Whitening Mask. *All counter brands can be found at the Tangs Beauty Hall or any Departmental store in the Orchard area. Sulwhasoo however is a Tangs exclusive. Other Korean street brands with stand-alone shopfronts. The Face Shop: Sheet masks, affordable makeup and nail polish. Wide range of skincare for all needs. Best seller: Rice Cleanser. Etude House: Sheet masks, cute packaging for everything. Best sellers: Pore packs, pimple patches, makeup range. Skin Food: Sheet masks, wide range of skincare. Affordable range of makeup and nail polish. Best sellers: sheet masks. Fancl (Japanese): skincare and beauty supplements. Best sellers: cleansing oil, collagen drinks. *These shops can be found in the Ion basement and perhaps Wisma Atria. Also, all Korean makeup brands pride themselves on the well-known BB Cream and there's just so many to choose from from so many brands! Our pharmacies as well stock as much makeup as they do actual pharmacy stuff, so it's well worth having a look. There's often an entire section devoted to Japanese imported makeup bits like eyeliners, double-eyelid tape, falsies, mascara..
SaSa is not as much a pharmacy as makeup heaven. Wisma Atria. Watson's at Ngee Ann City is huge and stocks brands like Embroylisse and La Roche Posay amongst other European pharmacy beauty brands. Guardian pharmacy at Paragon stocks the blog-sphere star of makeup removers, Bioderma. The last stop for beauty shopping is the airport. Do check-in early for departure if it's a godly hour (shops are closed in the wee hours). DFS beauty halls in our terminals are just amazing these days! You get brands like Bath & Bodyworks, Philosophy, Victoria's Secret etc. I love how you store your sunglasses (love your collection too btw), but what do you do with the cases? To take a break from shopping, I would definitely recommend the walk through the Singapore Botanical Gardens to see the Orchid Garden, and don't miss out on the "VIP" orchid greenhouse. It is so beautiful! From there you can walk down Orchard Blvd. Also, Jumbo Seafood in Clarke Quay has the best Sweet Chili Crab! That blazer may just about make me break my Primark-Free 2013 resolution! Drats! ooh I love that Topshop blazer...I have been looking at brightly coloured and printed blazers myself recently and have yet to muster up the guts to buy one (shame), but I have seen a few styled really nicely in blog, so I think I am going to crack the seal and just do it! That Topshop blazer is insanely gorgeous! 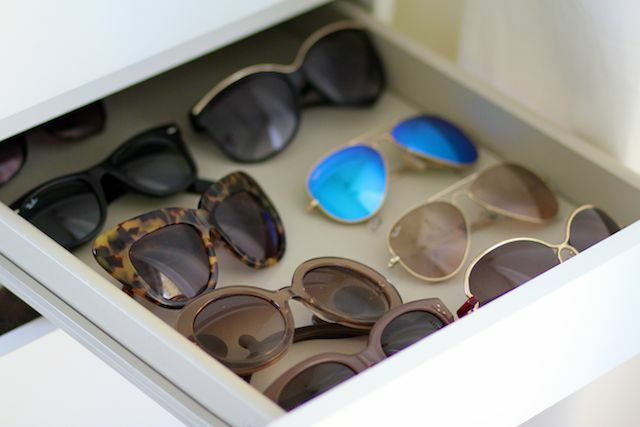 And I need to fill up a sunglasses drawer like yours asap! where did you get the top your wearing under neath the primark blazer? i love it! So excited for you to come to Singapore!Pls do enjoy the local food and shopping! That galaxy blazer is to die for!!! I'm a sunnies maniac too :) And I'm in love with the Primark blazer! Hey Laura! Is there b2m in Dubai? so true sunglasses are super important for every day. def. wishing for a collection like that. love the new ray bans addition too! There's a store that I've recently spotted that has these in every colour made, all evenly placed in the display, I can't make up my mind for the life of me!!! That bracelet is beautiful - I love everything from that store! love the lisa inspiration, she's been lookin' like a boss in those on RHOBH! The release date of Fifa 17 Game has been declared... Visit it to know about Fifa 17. Euro cup is round the corner. Want to know all the latest news and updates,check out my blog Euro Cup 2016 live"